From Millions Of Cases To 148: Guinea Worm's Days Are Numbered : Shots - Health News Years of effort to wipe out the Guinea worm parasite in Africa is paying off. Last year the number of cases dropped to a record low — 148, compared to millions in the 1980s. But war is complicating the low-tech efforts needed to stop spread of the infection. Young boys suspected of having Guinea worm infections wait for the parasite to emerge through the skin at a clinic in South Sudan. Guinea worm, pack your bags. 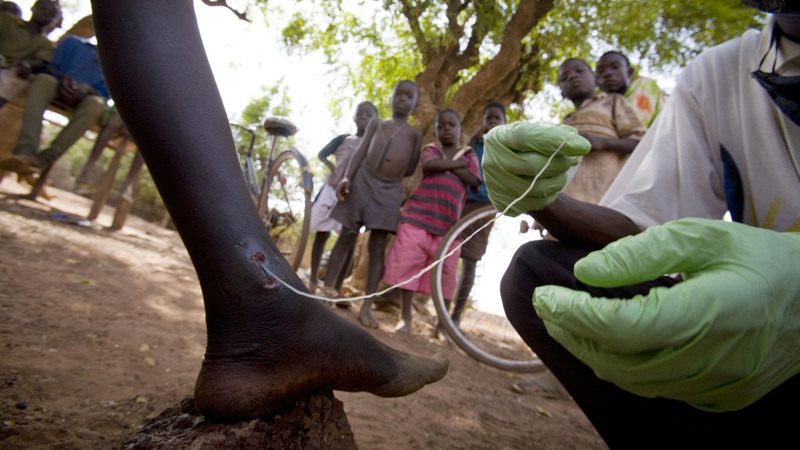 The world recorded only 148 cases of Guinea worm last year, the Carter Center said Thursday. That's nearly three-quarters less than in 2012, and a tiny fraction compared to the 3.5 million cases back in 1986. "That's very exciting because the number of cases at the end of 2013 are much lower than they were in 2012," says Ernesto Ruiz-Tiben, who directs the Guinea worm eradication efforts at the Carter Center. A medical worker extracts a Guinea worm from a child's leg in northern Ghana, February 2007. In fact, the steep decline in Guinea worm cases puts the parasite ahead of polio in the race toward eradication. Back in 2012, polio looked like it was on track to be the second human disease after smallpox to be eradicated from the planet. Polio cases were at an all-time low, only about 200 infections worldwide. And aid agencies had invested billions of dollars to vaccinate kids around the world against the virus. But the fight against polio suffered major setbacks in 2013. Global cases nearly doubled to 400. War and violence brought the virus back into two countries where it had already been eradicated: Syria and Somalia. So while polio surged in 2013, Guinea worm cases continued to drop. And now eradication of the parasite seems more reachable than ever. But, as with polio, war will be an obstacle to wiping out Guinea worm. Three quarters of the infections reported last year occurred in South Sudan, where fighting broke out a month ago. "When the conflict flared up in December, the conditions were so uncertain in South Sudan that the only decision we could make was to remove the Carter Center's expatriate staff out from South Sudan," Ruiz-Tiben tells Shots. "So the Guinea worm program was interrupted there." There is no vaccine or medicine against the parasite. So the fight against Guinea worm is low-tech: Health workers go from village to village educating people about the parasite. People catch Guinea worm by drinking contaminated water. The pathogen grows inside a person for about a year and then a worm, up to 3 feet long, emerges from a blister on the skin. Upon contact with water, the worm releases new larvae and spreads the parasite further. So simply filtering drinking water and teaching people not to transmit an infection are the key strategies for eliminating Guinea worm. A similar situation has also hindered efforts in Mali. The country reported only 11 Guinea worm cases in 2013. But fighting there prevented the Carter Center and local governments from working in the country for the past year and a half. "It's conceivable that the remaining cases in Mali have infected others," Ruiz-Tiben says. "So we may have outbreaks here and there." Nevertheless, Ruiz-Tiben is still confident the campaign can wipe out the parasite in a few years. "The target we set for ourselves is 2015, " he says. "But whether we meet that or not is unpredictable. Contingencies are hard to predict. But we're continuing to work hard." And as eradication efforts go, tackling Guinea worm has been a bargain. "We've spent about $350 million since 1986," Ruiz-Tiben says. By comparison, heath leaders say they need about $5.5 billion to finish off polio by 2018.